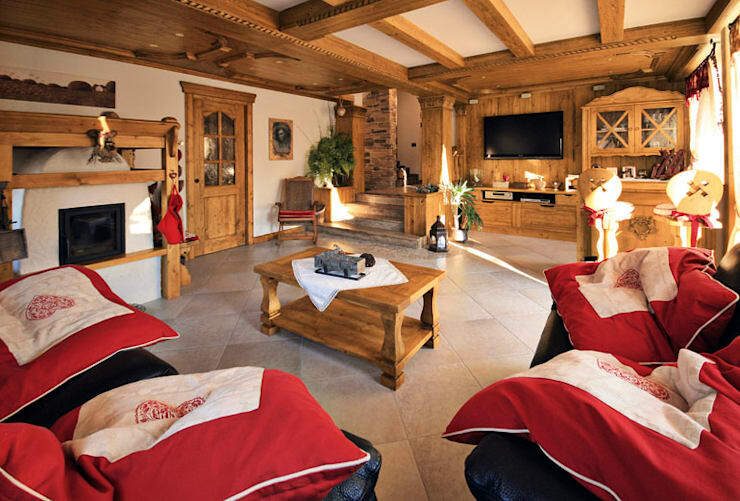 Today on homify, we have brought you a stunning array of images of a traditional country-style house with an alpine touch. Located in northern Italy and designed by architect professionals STUDIO ABACUS di BOTTEON arch. PIER PAOLO, the ingredients of this home include lots of wood, rustic country charm, traditional design and a good serving of modern comfort. We invite you to have fun and go on a tour of this beautiful home today, letting it warm the cockles of your heart! 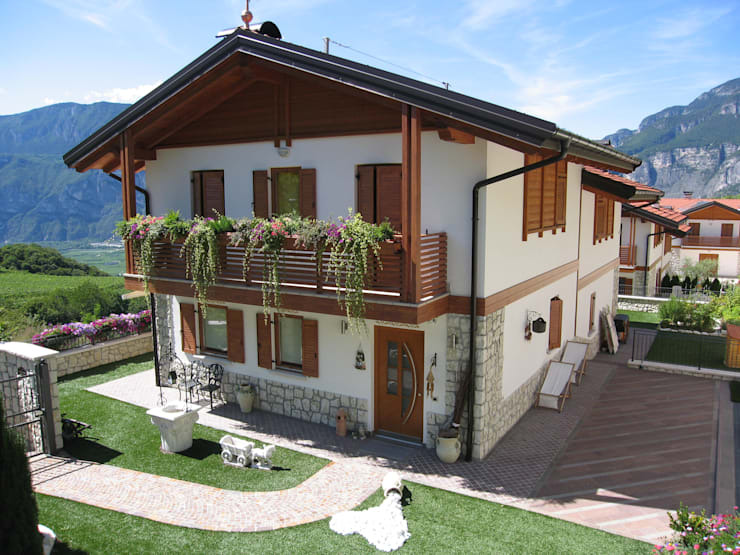 This house has everything that you would expect from a traditional detached house in the Alps: two floors, a white facade under a cantilevered roof, a balcony, gables, warm wooden shutters and natural stone elements. There is even a gorgeous garden on the upstairs balcony! With this exterior look and feel, the building not only harmoniously adapts to the neighborhood but it also integrates seamlessly into the mountainous natural landscape. Before we enter the house, we take a closer look at the facade around the entrance of the home. There are numerous traditional elements and design accessories typical of the region decorating this space. The natural rustic stone cladding also enhances the exterior design, but you'll also notice that there are some modern accents throughout. The front door, window shutters and balcony introduce warm wooden elements to the space. The interior design of the house mirrors the external architecture. Here too, we come across traditional, rustic and regional elements and details. Wood also dominates throughout this space, enveloping you in warmth and charm the moment that you step the door. In the living room, we come across a traditional fireplace and textiles typical of this area of the world. It would almost feel like a journey into the past if it weren't for the electronic devices such as the large, flat screen television. 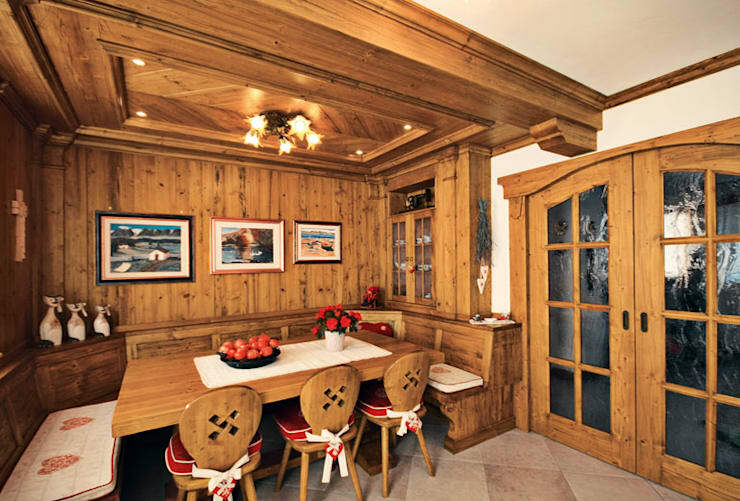 The dining area also features a very traditional design. The seating in the corner looks particularly cozy with the corner bench and wooden paneling. This is enhanced by the comfortable cushions with heart prints. The decor elements, including the paintings, flowers and vases, create a beautiful finishing touch. 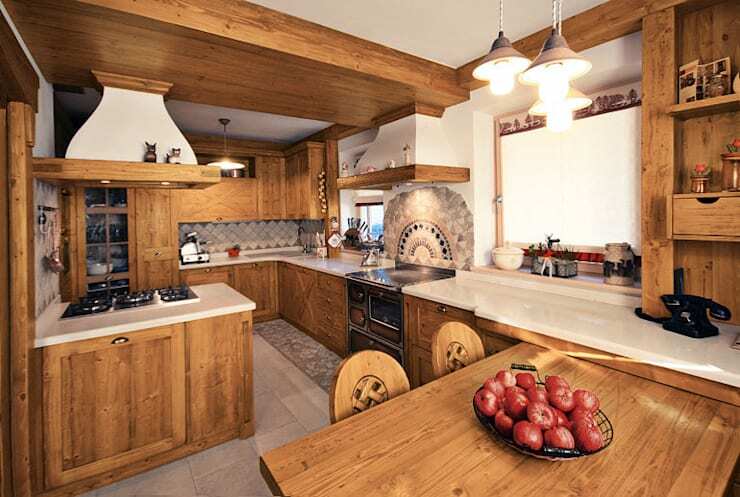 With an abundance of wood, the kitchen maintains that traditional country-house charm. This is further enhanced by the beautiful tiles and carefully selected accessories. Next to the old stove there is also a modern gas stove, enhancing the practicality and functionality of this space. The designers haven't overwhelmed this space with too many decor items or accessories, keeping a clean look and feel throughout. Even in the bathroom we find a balance between trend and tradition. While the materials are rustic, the bathroom features are very modern. 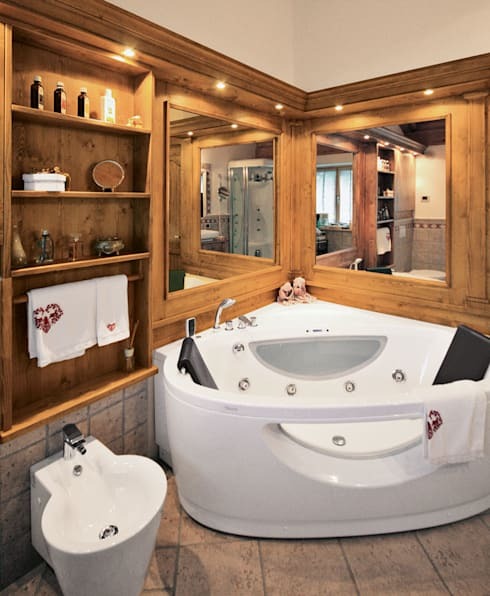 Couldn't you imagine relaxing with your partner in this very comfortable looking tub? The lighting also works to create a moody and romantic atmosphere! If you've enjoyed exploring this home, you'll love these 10 wooden homes that will make you yell wow!